Composers notate music on interlocked treble and bass clefs. As an intuitive and synesthetic musician, I am acutely aware of the delicious net effect of using both hands to play the piano. It’s not just the resulting harmonious fullness of the sound, it’s the complex relationship between fire and ice, darkness and light, muscular tension and emotional release. 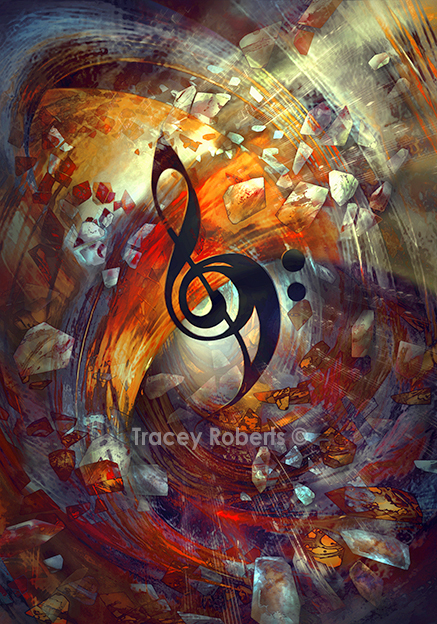 I am in awe of those who can interpret the mysterious array of symbols on both treble and bass cleffed staves, to create swirls of notes and colour intermingling and co-operating with these aforementioned intangible forces, sweeping through time and space, creating the universal phenomenon and magic that is music. This artwork was created for the 2017 Dandenong Ranges Open Studios group exhibition with a theme of "Duality"